There are a record 4909 applicants for the 2018 Western States lottery. This is a 15% increase over the 4248 applicants for the 2017 lottery. The lottery will be held on December 2, 2017 in front of a live audience at the Placer High School auditorium in Auburn, CA beginning at 8:30 a.m. We expect to be done by 11:00 a.m. As names are pulled from the hat, they will be posted at http://www.ultralive.net/lottery as close to real-time as possible. There will also be a live video feed on our Facebook Page. As described on our lottery page, each runner who enters the lottery and fails to gain entry into the Run (and otherwise doesn’t gain an entry via other means such as an aid station, sponsor, or Altra Golden Ticket spot) will have additional tickets in the hat when entering the lottery the following year, thus improving the probability of being selected. Every lottery applicant will receive 2^(n-1) tickets in the hat where n is the number of consecutive years entering the lottery without gaining entry. That is, 1st year applicants = 1 ticket, 2nd year = 2 tickets, 3rd year = 4 tickets, 4th year = 8 tickets, 5th year = 16 tickets, 6th year = 32 tickets, 7th year = 64 tickets. The maximum number of years for the 2018 lottery is once again 7, or 64 tickets. You can view the applicants and their ticket counts and the pdf of the 15074 tickets that will be printed, cut and then put into the barrel. So what are the chances of getting into the race if you are selected for the wait list? In 2017 the last person to get a spot on the starting line was drawn 39th on the wait list. Twelve runners before that 39th runner either removed themselves or declined the spot when offered. Look here for complete 2017 wait list data, including when each runner was offered a spot. 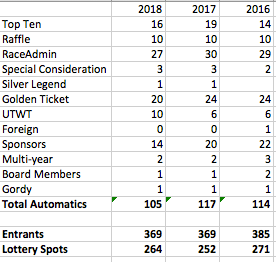 Finally, here are the 105 automatics (down from 117 in 2017 lottery) which will be identified on the entrants list when we post on wser.org after the lottery.